Every cat’s humans do stupid things once in a while but my peeps are the Champs. This year wasn’t nearly as bad as the year that they had two raw turkey blood juice spills which led to two floor steam cleanings or the year TW spilled half the pumpkin pie filling on the oven door. My fave Thanksgiving mishap was the year they bought Mrs. Smith’s pies rather than making their own but didn’t know you had to bake them before eating. You can imagine what transpired when Pop “poured” the pumpkin pie out of the box! Clean up in Aisle 6!! Bring a mop! To save money, TW decided to get Pillsbury frozen pie crusts instead of the Keebler ones she buys every year for the pumpkin pies. Since they seemed a little flimsy, she placed a cookie sheet underneath them as per the directions. The part she DIDN’T read, would have told her to preheat the cookie sheet while heating up the oven. She carefully placed the filled pies on the cold cookie sheet and carefully shoved it all into the oven. Then she went back to the computer. BOING!!! TW went racing into the kitchen. What was that loud scary noise? The cookie sheet warped on one side and the pie fillings all shifted to one side. Fortunately for her but unfortunately for me, there was NO spillage, She couldn’t figure out a way to even out the pies. Heh heh. The peep claimed that lopsided pies taste as good as even ones. Sorry, no pics were allowed. Then there was small matter of the turkey. The peeps had it in the refrigerator thawing since last Saturday but it was still frozen when Pop finally got out of bed around 10 am. He panicked. Finally TW looked online and found out you can cook a partially frozen turkey but it takes longer. The only problem was that our afternoon turkey dinner would be delayed until 7 pm. What’s wrong with that, I hear you axing. I HAD AN 8 PM #NIPCLUB SHIFT TO DO!! Would they be finished eating dinner by then? Wow, I'm glad my human didn't cook! I'd be afraid of what SHE would do! Fortunately, she and her boyfriend went out - and returned with a wealth of turkey for us kitties! It was awesome. Well better late than never we say. Hope despite the odd mishap you had a swell time. Have a fabulous Friday. Love the story about the pumpkin pie. Sounds like something our Person would do. Have a great day. This is why the peeps went out to eat yesterday. But that meant no good stories and no leftovers for us. We do not approve of the plan at all. You should consider filming that funny stuff for a candid camera show! You would have loads of material!! You are an excellent guard against spillage CK. Oh my the wonderful stories you do tell CK!!! WE love it. ha ha - well at least you had Thanksgiving. My humans went off and left me all alone from 10:30 to 5:30. Do you think they even brought back a plate of food for me - no! What is wrong with our humans? I really am worried about them - very strange behavior out of most of them on the Blogosphere. Sounds like you had a pretty entertaining Thanksgiving, CK. The mom learned that you can thaw a turkey out by letting it sit in water. She had to do that one year. This year she remembered to take it out of the fridge the day before to make sure it was thawed out. Those turkeys never seem to want to thaw out in the fridge. OMC This is too darned funny!!!!! That pie crust thing sounds like something that I would do! CK looks adorable in the video, so patiently waiting! But the important question is: Did the kitty ever get her share of the turkey???? Huh? I mean, you did a lot of patient waiting around for no payoff in that video. That sure looks like some tender and succulent bird there--I just don't see that the Kitty got any, and that is just WRONG. We laffed so hard about the raw pies our whiskers are wet! Haha... your peeps dinner looks tasty CK. 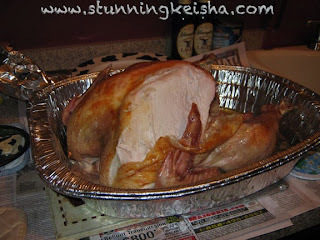 I ate 3 different feasts including my own... but I bought a cooked turkey (it was delicious and 2 pies that were already cooked too! Sheesh! You barely made it through the day! She once dropped an entire, uncooked, cheesecake she was baking for a very special occasion at her dad's years ago. They looked at each other, looked at the clock and then both proceeded to scoop up the batter and put it back into the pan. The cheesecake turned out perfectly and they both exchanged some funny grins while Glogirly served dessert. MOL about the pies! What would the peeps do without online help? Glad they managed to cook the turkey in the end. Did you get some? Your humans must be related to our Jan. Oopsies are her forte.